The Rubbermaid Commercial Americana Open-Top Trash Can with Rigid Plastic Liner maintains the upscale appearance of your grounds while providing exceptional waste control. This garbage can is perfect for your hotel, resort, atrium, pool, or convention center. Round and sleek, this trash bin features vertical one-inch wide welded steel slats surrounding its steel body. Its open top disposal opening enables hands-free disposal, maximizing customer comfort and sanitation. 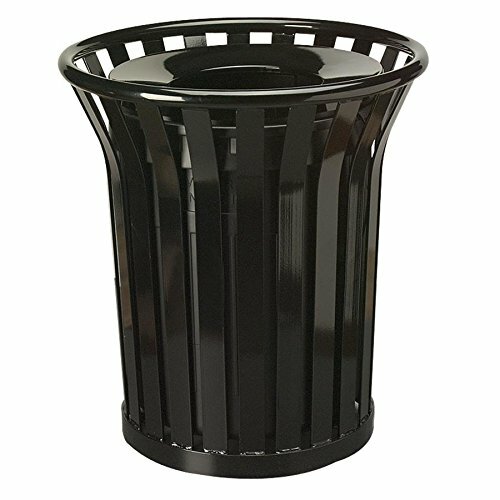 Made from 30% post-consumer recycled content, this fire-safe garbage can features a rugged steel construction complete with a leak-proof rigid plastic liner. Multiple layers of durable powder coating ensure maximum life and use. Providing lasting strength and durability through changing weather conditions, this trash bin includes a UV-stabilizer. Leg levelers provide additional stability on even and uneven surfaces. Prevent the passerby from rummaging around your garbage cans with the vandal-resistant, cable-secured funnel. The funnel top may be lifted off for easy emptying and servicing.